PWCC Marketplace, the largest seller of investment-caliber trading cards, has released first quarter 2019 performance data on investment returns associated with vintage and modern trading cards, a tangible asset class that has seen growing popularity amid a more liquid marketplace for collectibles. As of April 2, 2019, the PWCC Top 500 index achieved a 176% return on investment since January 1, 2008 and jumped 15% in the first quarter of 2019, beating the S&P by 2%. The PWCC Top 100 achieved a 286% ROI since the start of 2008 with a 2019 first quarter rise of 11%. Both scenarios represent a significant outperformance of the S&P 500 over the same 11-year period. 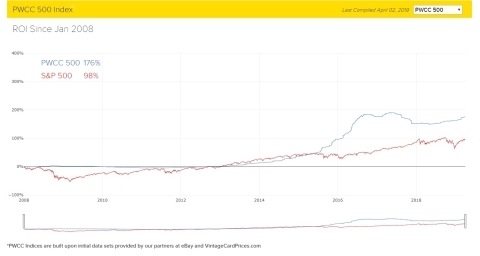 In early 2018, the company created a set of market indices, including the PWCC Top 500 and the PWCC Top 100, that show how different subsets of the market–the 500 and 100 most valuable trading cards (as defined by sales price, trading velocity and other factors)–have tracked against the S&P 500. As markets for traditional assets remain volatile, nontraditional assets such as art, wine and collectibles are getting a closer look from investors. PWCC obtains original sales data through a partnership with VintageCardPrices.com and uses its own proprietary software to capture trading card value. PWCC has been collecting and tracking these figures since 2008. Since 1998, PWCC has provided buyers and sellers of both vintage and modern graded trading cards with an efficient, secure and predictable marketplace. Compared to traditional, more fragmented auction environments, PWCC offers technology-driven efficiencies in line with electronic financial exchanges, including reduced transaction costs, faster turnaround times, increased liquidity and greater transparency. PWCC’s proven platform provides collectors and investors with the most trusted way to invest in trading cards. Find out more and follow live auctions at www.pwccmarketplace.com.